This system creates the illusion of a solid surface that instantly blocks traffic. 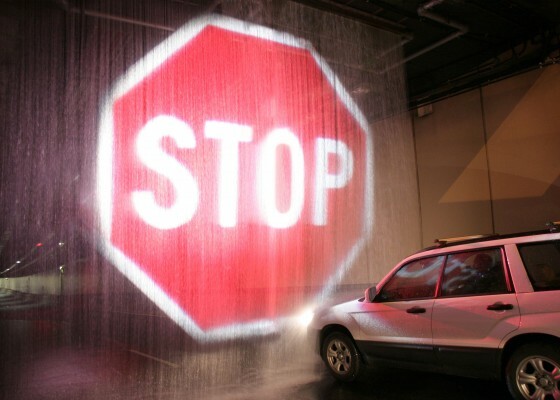 The Softstop™ Barrier System produces a pseudo-holographic image that appears to float in mid-air, commanding the attention of the motorist, making the “STOP” message impossible to miss! In conjunction with Tunnel Holdings Pty Ltd (owner and operator of Sydney Harbour Tunnel), Laservision successfully developed and installed a radical new tunnel warning system that solves the persistent problem of drivers ignoring other conventional signals to stop before entering motorway tunnels. Passing under Sydney Harbour between the Harbour Bridge and the Opera House, the Sydney Harbour Tunnel was originally built to alleviate congestion on the Harbour Bridge. The tunnel was designed to be strong enough to withstand the impact of earthquakes and sinking ships and averages over 30 million vehicles per year. Since opening, the tunnel has endured over 10,500 traffic incidents ranging from accidents, breakdowns, fire and the odd beachgoer running out of fuel. Delays and closures prove very costly for the Sydney community as the tunnel is a key access route for the city’s business district and eastern suburbs. Extreme examples of tunnel disasters include Mont Blanc (France) which claimed 39 lives and burnt for 52 hours. A year later 12 people perished in the Tauern tunnel (Austria) and the Gotthard Tunnel (Europe) which claimed 11 lives. When a fire breaks out in a tunnel, vehicle occupants are not spectators to an accident, they are potential participants in a disaster. The Laservision system creates the illusion of a solid surface that instantly blocks both southbound lanes of traffic. The Softstop™ Barrier System produces a pseudo-holographic image that appears to float in mid-air, commanding the attention of the motorist making the ‘STOP’ message impossible to miss. Unlike conventional warning lights, signals or signs that appear in the peripheral vision of drivers, the ‘Softstop Barrier System’ is the only visual messaging system that appears in the direct view of drivers. Besides the human toll, these disasters cause severe damage to infrastructure. Freight routes and even entire economies suffer as a result. The Softstop™ Barrier System was developed from Laservision’s government endorsed Research & Development laboratories. Leading projection technologies were trialled in the project’s research phase. Air, water pressures and a myriad of other issues were addressed in both day and nighttime scenarios. This testing was then followed by a week-long trial onsite. Additionally, a myriad of other fail-safe and pre-emptive strategies make ‘Softstop’ a highly effective, rapid-response barrier system. He further stated, “this fire was the catalyst for engaging Laservision to develop the solution”. During peak times, over 12,000 vehicles are inconvenienced by these incidents hourly. 4,000 cars an hour are directed away from the tunnel to join the already congested Sydney Harbour Bridge route. Although Softstop™ gives motorists a confronting message, “STOP”, the product does allow for people and emergency teams to pass through without incident. The product is also forgiving for motorists who cannot stop within the reasonable response time. Once the traffic has been brought to a standstill a second ‘physical barrier’ is utilised. Once initiated the ‘Softstop™ Barrier System’ is usually on for approximately 1-2 minutes.